Honestly, this really isn't much of a recipe but rather ingredients I love together. 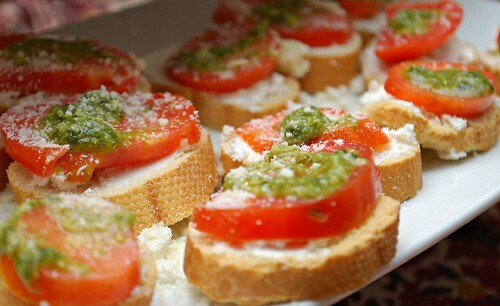 Buttery toasted bread rounds are topped with a sweet slice of roma tomato, a dollop of pesto and a sprinkling of Parmigiano Reggiano cheese. To make these a bit heavier, you can add a slice of salumi. These can be served as is or drizzled with a bit of good olive oil and/or balsamic vinegar. As for making these, I would advise not to assemble them too much in advance. Depending on how juicy your tomatoes are, it's best to assemble just as guests arrive or better yet, have them help in putting them together. Another alternative is to set all ingredients out and have guests assemble them at their leisure for a 'crostini bar'. 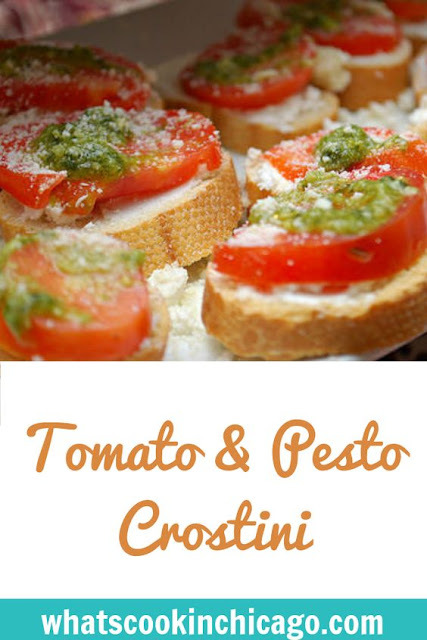 On top of each bread round, top with tomato, a dollop of pesto and garnish with a sprinkling of Parmigiano Reggiano cheese. To serve, drizzle with olive oil and balsamic vinegar if desired.